Our first day in McCall was spent getting to know this mountain town, as well as hitting the slopes on Brundage Mountain. 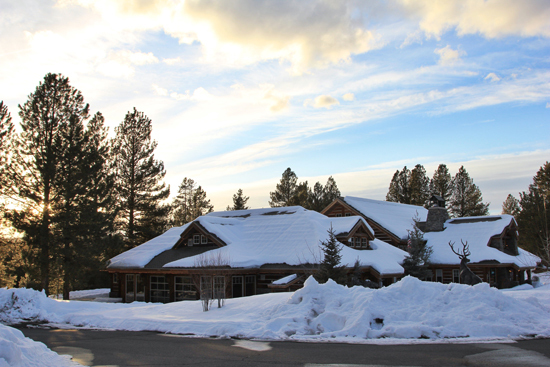 The beauty of McCall is its close proximity to everything. Traveling the Pacific Northwest with our Airstream travel trailer is our favorite way to explore this part of our country. 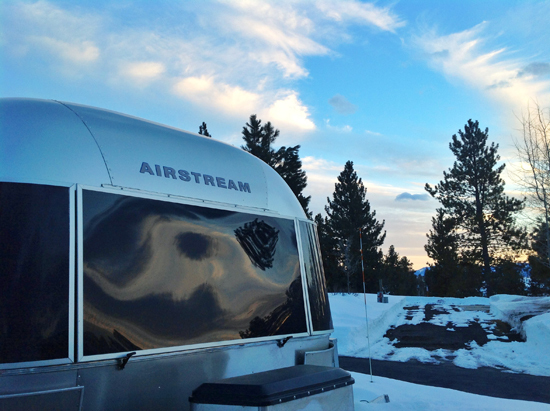 Always on the ready, our Airstream has served as our "home away from home," for almost three years now while visiting some of the most breathtaking spots this area has to offer. Our most recent trip took us to the four season resort town of McCall, Idaho, which is located approximately 470 miles from Seattle, WA. We made the drive in nine hours and arrived at the McCall RV Resort & Northfork Lodge, which would be our Airstream's base camp for the next six days. Hubby and I both agreed that this was probably one of the nicest RV parks we have ever camped, as it offered spacious sites with full hookups and amenities galore from an indoor heated pool to hot tub and a great workout facility. The close walking distance to downtown McCall was also a winner in our book. Our first day in McCall was spent getting to know this mountain town, as well as hitting the slopes on Brundage Mountain. The beauty of McCall is its close proximity to everything. Brundage Mtn. is so close that the locals often take their lunch breaks to get a couple runs in. On the day we visited, we experienced virtually no lift lines and the high speed quad chair whisked us 1,556 vertical feet in seven minutes to the top. Once at the top, we couldn't believe our eyes. The views that greeted us here were beyond breathtaking, from the Salmon River Mountains to the beautiful Payette Lakes, as well as Oregon's Eagle Cap Wilderness. This view was the backdrop to our skiing adventure we had on Brundage Mtn. and it will be an experience we will never forget. It was still light outside when we arrived at the Shore Lodge for an apres-ski dining experience we have been looking forward to. As we entered the lodge we were welcomed with a warm, inviting décor featuring huge pine logs and river rock. 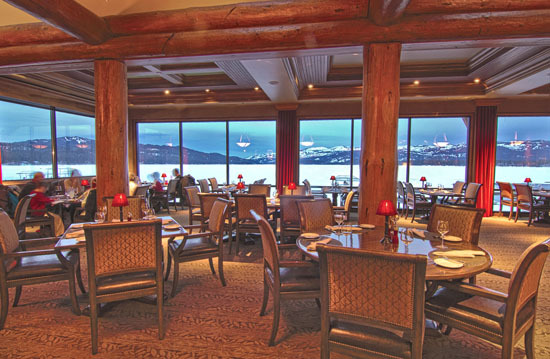 At "The Narrows" restaurant we enjoyed views of Payette Lake and Payette National Forest through the floor- to-ceiling windows while we dined on "melt in your mouth" filet mignon with succulent lobster. It was the perfect ending to our first day in McCall. We headed back to the Airstream and hit the sack early as the following day we had a plan to Snowmobile to hot springs. 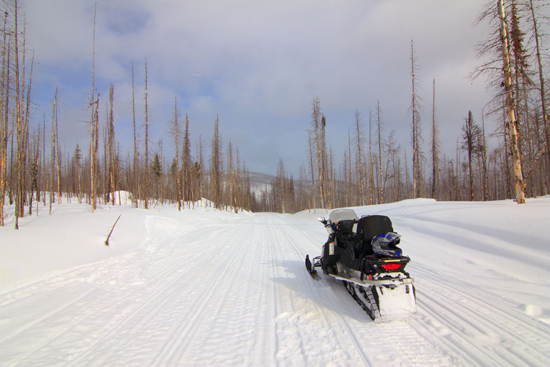 We rented a couple of snowmobiles from Peggy and Chuck who run Cheap Thrills Rentals. Having never snowmobiled before, we appreciated the thorough instruction Chuck gave us around the workings of the snowmobiles. Before we knew it, we were off through the beautiful Payette National Forest to our destination of the Burgdorf Hot Springs. 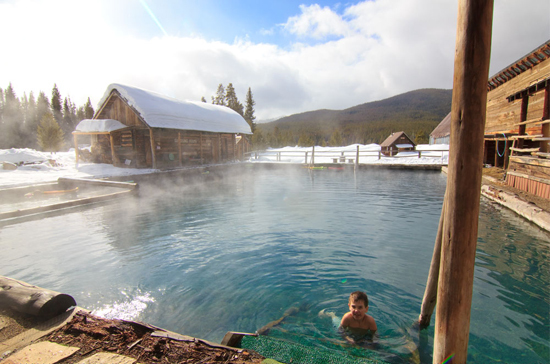 Open to the public since 1860, these hot springs are a favorite of locals and visitors alike. Soaking in the springs with our wintry surroundings was purely magical. Flowing at a rate of 150 gallons per minute, the natural spring water continually feeds the main pool with natural "lithium" infused warm water. It was no wonder we felt so relaxed and drove the snowmobiles back just a little slower than when we arrived. We headed back to base camp and had dinner in the Airstream that evening. One thing I truly adore about my Airstream is the fact that I can cook while on the road, sourcing local ingredients from the many places we visit. But this trip would be different. We would be busy! So before we left on our trip, I sourced our meals "Airstream style." The Skillet Airstream in Seattle, WA offers some of the most over the top comfort food one can imagine and is all prepared from inside their Airstream trailer. So for the times on this trip that we didn't dine out, we enjoyed the best mac 'n cheese with a kale Ceasar salad, as well as chipotle pumpkin bbq pulled pork that we devoured alongside Brussels sprouts covered with Skillet's very own bacon jam. I will definitely be sourcing my Airstream dinners from them again, that is for sure. As we sat together cozy in the Airstream, dining on our delicious fare, we reflected on our trip and discussed what the next day would bring. 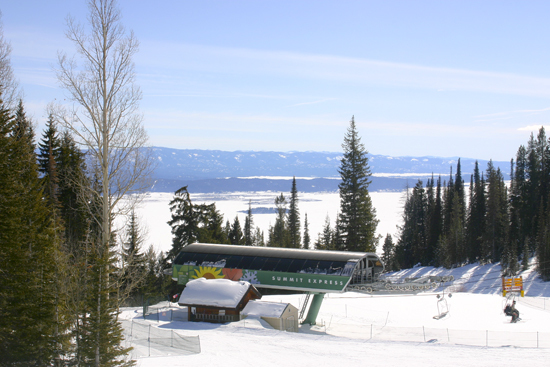 Hubby and I both agreed that we couldn't visit McCall without skiing Tamarack Resort. Located near Donnelly, ID and about 30 minutes from McCall, we arrived the following morning where the outside temperature was a perfect 19 degrees F, the skies were crystal clear and four inches of new snow had fallen overnight. 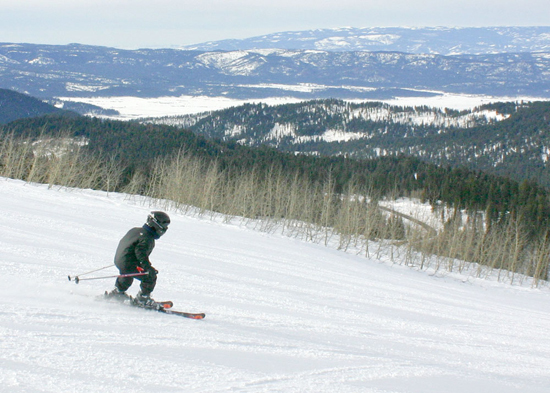 Tamarack enjoys a 2,800 vertical drop that is filled with open bowls, glades and challenging back country. We enjoyed the high speed quad chairs that took us to the top in minutes and once again, enjoyed nonexistent lift lines. One thing was for certain, Tamarack's terrain, quality of snow and breathtaking views are a recipe for success and we can hardly wait to come back. 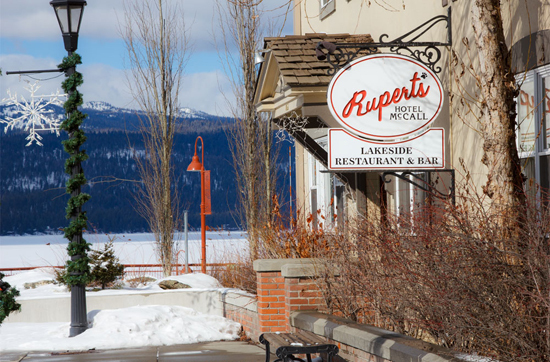 An après-ski dinner that evening was at Rupert's Restaurant located at the Historic Hotel McCall right in the heart of downtown McCall. Light filled the spacious dining room from the huge windows that offered a beautiful view of Lake Payette and the Payette National Forest. To my surprise I learned that the chef of Rupert's, Chef Gary Kucy had been selected as a semi-finalist for the 2013 James Beard Awards for "Best Chef: Northwest." I've never had the honor to enjoy a menu created by someone with such a high accolade and I was really looking forward to the experience. Our dinner that evening was full of unique flavors from the sake steamed clams with ginger soy butter to the traditional Basque croquettes. It was another dining experience to go down in the travel record books. Simply outstanding. On the last day of our trip we experienced what we like to call our "Grand Finale," trip experience. A winter culinary adventure in the forest! 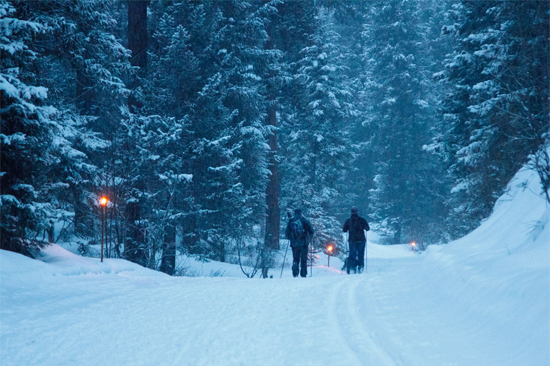 Only accessible via snowshoeing or nordic skiing, we made our way in one mile through the Ponderosa Park along a tiki torch lit trail to the Blue Moon Yurt. 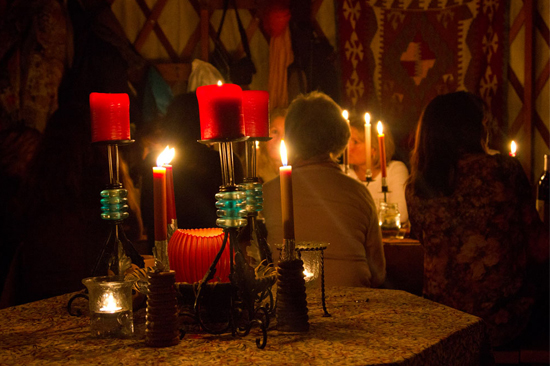 Upon entering, Persian rugs graced the floor of this yurt and the family style tables were decorated with beautiful glowing candles and fine linens. The warmth from the wood burning fireplace was immediately noticed and we were greeted by smiles from everyone (26 to be exact). With rosy cheeks and all, we made our way to our seats to meet our new friends that sat across from us. "Welcome everyone to the Blue Moon Yurt! We are very happy to have you with us tonight!! Tonight one of the menu items you will be enjoying will be "Somai's Soup." Not too long ago my friends and I took a trip to Anchorage Alaska and Somai was this beautiful tiny Thai woman cooking in a place called the Thai Market. I don't know if it's still there, but when you walked through the doors you headed to the back of the place and there were just a few tables and chairs for patrons. Somai was cooking off of two funky burners pumping out the most amazing food. When we first tasted the soup we thought we had all died and gone to Thai heaven. We were in Alaska for three weeks and we went every other day (if not every day) to have her soup. We were completely addicted! Somai did eventually share her recipe for this soup with one of my dear friends who in turn, shared it with me. I am happy to be able to cook this soup for you here, in the Blue Moon Yurt. Full of flavors from the galanga root (a cross between ginger and eucalyptus), lemongrass, chilies, kaffir lime leaves, coconut milk, chicken, straw mushrooms, topped with cilantro & green onions. It truly is a bowl of love. Enjoy! Well, Lisa was right. That soup was incredible and we did feel like we died and went to Thai Heaven. Not only was our experience at the Blue Moon Yurt another adventure we would not forget, but our entire trip in McCall was one that would be truly memorable, forever. It was our first trip to McCall and it will definitely not be our last!